The XB-70 is one of the world's most exotic aircraft that was conceived for the Strategic Air Command in the 1950s as a high-altitude bomber that could fly three times the speed of sound. Due to limitations on funding, only two XB-70 aircraft were built for the advanced study of aerodynamics, propulsion, and other related subjects of large supersonic aircraft. The XB-70 Valkyrie was mainly built of stainless-steel honeycomb sandwich panels and titanium. It was designed to make use of a phenomenon when the shock wave generated by the airplane flying at supersonic speeds supports part of the airplane's weight, this is called compression lift. For better stability at supersonic speeds, the XB-70 could droop its wingtips as much as 65 degrees. The first XB-70 made its first flight on September 21, 1964, and reached a speed of Mach 3 flight on October 14, 1965. The second XB-70 first flew on July 17, 1965, but on June 8, 1966, it crashed due to a mid-air collision. The first airplane continued with the research program until flown to the United States Air Force Museum on February 4, 1969. With research and development studies beginning in the mid 1950s, the XB-70 was a large, long-range strategic bomber that was planned to be the replacement for the B-52. As in the B-58 program, the Air Force wanted new technology advances. To this end, the Air Force gave the prime contractor total weapon system responsibility. Boeing and North American competed for the contract during the design phase. Then, in 1958, the North American design was chosen and a development contract was awarded. The Air Force requirement for this replacement was for a Mach 3, high-altitude, long-range bomber capable of carrying nuclear and conventional weapons. Although there was a technological breakthrough in 1957 that made Mach 3 possible, the XB-70 never went into production. The continuing emergence of new SAMs was the key factor in the demise of the XB-70 Valkyrie, just as it affected the B-47 and B-58. The XB-70 had a length of about 196 feet, a height at the tail of about 31 feet, and an estimated maximum gross weight of 521,000 pounds. It had a crew of four, which included a pilot, copilot, bombardier, and defensive systems operator. The delta wing had a span of 105 feet with six turbojet engines side by side in a large pod underneath the fuselage. A large canard fore plane near the front of the fuselage with a span of 28 feet, 10 inches was used for stability. In addition to its delta wings, the XB-70 had two large vertical stabilizers. The aircraft was fabricated using titanium and brazed stainless steel honeycomb materials to withstand the heating during the sustained high Mach number portions of flight. The propulsion system consisted of six J93-GE 3 engines with two large rectangular inlet ducts providing two-dimensional airflow. The entire mission was to be flown at Mach 3, but even in the 1960s, the aircraft was vulnerable to SAMs. A high altitude, Mach 3 penetrator cannot maneuver well. Its straight and level trajectory would have been an easy course to plot and intercept. Further, the technology that made Mach 3 possible yielded an airframe with a large radar cross-section that added to the effectiveness of SAMs against the XB-70. The XB-70 design had payload flexibility but not mission flexibility. In 1959, the XB-70 concept was changed to a reconnaissance/strike aircraft, making it a reconnaissance aircraft with a bomber strike capability. However, its reconnaissance capability would not have been as good as the super high altitude aircraft designed to fill the reconnaissance role, the SR-71. The XB-70 is an aircraft which met the criteria it was designed to meet, but whose mission had been eliminated by defensive threat technology. In 1961, the XB-70 program was to be reduced to research only, citing high cost of over $700 million per prototype and vulnerability. 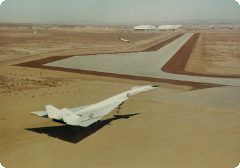 Although two XB-70 prototypes were built, with the first flight in 1964, the program terminated five years later in 1969. During the early 1960s, the NASA Flight Research Center was involved in support of the national Supersonic Transport Program. These two aircraft became available for SST research with the cancellation of their intended military program. Aircraft serial #62-0207 with its improved wing design, was capable of sustained Mach 3 flight at altitudes around 70,000 ft. An attempt to substitute the slower aircraft (serial #62-0001) into the research program met with limited success. Ship #62-0001 was flown by the NASA Flight Research Center from March 1967 through early 1969. The XB-70A program produced a significant quantity of information about supersonic flight up to Mach 3 speeds. In many areas, such as noise, clear air turbulence, flight controls, aerodynamics and propulsion system performance and operation problems, it related to SSTs. Six General Electric YJ-93s of 30,000 lbs. thrust each. Page rendered on 25 April 2019 at 00:13:49 in 359.058 microseconds.